On July 18, 2009, Willy Aybar, who had not played in 6 days, who could barely play second base and had hardly proven himself as a hitter, got the start at second against eventual the AL Cy Young winner, Zack Greinke. Aybar went 4 for 4 with a game-deciding double. Rays manager Joe Maddon told the media the choice to start Aybar had been a deliberate one, a decision based in the front office’s proprietary analysis. I remember the event — reading the post-game interview moreso than seeing the game — because it marked the first time in my baseball-viewing experience where I had seen a lineup decision apparently based according to ground ball and fly ball data. Entering the 2009 season, Greinke had a 37.9% ground ball rate — making him one of the league’s more extreme fly ball starters (this has since changed). Aybar, meanwhile, finished his short career with a .349 wOBA against fly ball pitchers and a .300 wOBA against ground ball pitchers. THEORY: Batters with an uppercut swing will succeed more against ground ball pitchers, and hitters with a more level plane will succeed more against fly ball pitchers, and — naturally — hitters who can swing on both planes will have a smaller overall split. NOTE: Many GIFs are under the jump. The page may load slowly. An uppercut swing, a swing that — more specifically — forms a more acute angle with respect to the batter’s torso, has a greater chance of running into a ground ball pitcher’s ground ball pitch. Most ground ball pitchers toss a two-seamer, splitter, sinker or some manner of lower-than-the-batter-expects pitch. So if the bat head matches the break of the pitch — if the pitch breaks along the swing plane, instead of above or below it — there is a greater chance for Kapow Magic, right? Likewise, a fly ball pitcher works high in the zone or throws pitches that get the hitter’s bat underneath the ball. An uppercut swing has not only more ground to make up, but also has a narrow time slot where the sweet spot and the pitch meet in the swing plane. Moreover, a vertical follow-through increases the odds of a pop up against a fly ball pitcher, whereas that same swing can — so to speak — dig out a ground baller’s pitch. When I was first learning to swing the bat, the learned baseball man teaching me to swing said something to the effect of: “You’re a turd, son; don’t dip your back shoulder — that’s for home run hitters. You need a nice level swing, to hit line drives and such.” Well, joke was on you, hitting coach. You cannot hit line drives if you can’t make contact. Anyway, there are other ways of looking at this: Hitters who use uppercut swings only do so when swinging for yon fences. Also, hitters who do well against ground ball pitchers are going to be swinging at lower pitches and thereby will be forced to swing with the bat head pointed more towards the ground. These are both valid points and we will examine them in a moment. But first, we need to define what a ground ball pitcher is and what a fly ball pitcher is. I polled some of the FanGraphs authors, and they felt a neutral pitcher would have a ground ball rate between a 43 and 47% GB-rate. I think that’s a solid grouping, except that the more natural grouping is in fact 40 to 50% GB-rate. Not only are there a ton of near-47% pitchers that would be somewhat unfairly classified as GB pitchers, but — if we choose to use a GB-to-FB/LD ratio — a 50% GB-rate is a clean 1.00 GB/(FB+LD) rate and 40% is a clean 2/3 ground-to-air ratio. Classifying neutral pitchers as being within 40 to 50% GB-rate also fits with the past three season’s median absolute deviation of the median ground ball rate. Whereas only a third of MLB pitchers are lefties — thereby requiring platoon reactions — almost half the league is a fly or ground ball pitcher. So how can teams know which hitters to use or not? In The Book, Tango, MGL and Dolphin say it takes 2000 PA to know a true platoon split. In all likelihood, no team will have data of 2000 PA of each batter vs. GB pitchers — there’s simply too few GB pitchers and not enough playing time. Only the stars who start every game of their first five or six MLB seasons will have sufficient data at a useful time. Moreover, pitchers can change their pitch repertoire and suddenly change their classification. As alluded to earlier, Greinke went from an extreme fly ball pitcher in his first four seasons to a neutral pitcher in his second four seasons and now has crossed over 50% GB-rate this season. Nonetheless, we have to throw ourselves on the mercy of the limited data. The data I’ma boutta throw at you. 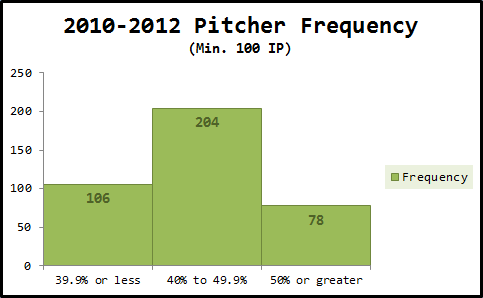 The data is currently limited to a minimum of 200 PA vs. GB pitchers, but you can change that if you’re feeling frisky. Odds are: You’re just going to want to download this puppy using the green button yonder ^ (that way you can see everything and enjoy the frozen rows and columns and whatnot). So now we can start to examine who appears to have and not have significant splits. Again, in case you have ignored the waterfall of text preceding this, it is important to emphasize the insufficiency of this data. These number are calculated (by excruciated hand) from 2010 through Monday’s games, which means no one is going to have more than 400 PA against a ground ball pitcher. Ideally, we would have 2000 PA for everyone, but changing external forces (such as pitchers changing their GB ratios and the ever-changing BABIP and run environments) force us to use this smaller, more specific set. The study — if enough people find it at least intriguing — can be extended to cover more years (assuming the great and magnanimous Jeff Zimmerman will claw the data mountains with his spade of wisdom for me again). A couple of players in the data make some pretty big and interesting data points. Let us start with Texas Rangers outfielder David Murphy. Murphy represents a rare culmination of numbers. He has not only the biggest positive wOBA difference against GB pitchers, but he also has the largest gap in power factor — which helps us assume away plate discipline and look at oomph per hit instead. And if we look at Murphy’s swing, he takes almost the same hack every time. It is a big, mighty, vertical swing that just yesterday, against extreme ground baller Alex Cobb, produced a 2 for 4 outing. It is important to understand that even the players with the most consistent swings will have different angles from time to time. The angle they swing the bat needs to be a product not only of the habits that have made them successful, but also the location of the ball. I am by no means suggesting every hitter swings on the same plane on every swing (I’d be crazy to propose that). Nor do I think an uppercut hitter will never swing at a much higher angle either. In fact, some hitters will have success against both GB and FB pitchers because they deliberately (if not consciously) change their swing angle to meet the ball. The first swing is at a ball almost at the belt. He still managed to get to the ball, however, and produces what looks like an uppercut swing, but judging from the angle of his bat from an invisible (or red, in this case) line perpendicular to the ground, he’s actually at a fairly level 65°. The other two swings show Murphy at his normal — and, in a sense, his best. The angle is well beneath 55° and he is able to dig the ball from the lowest parts of the zone and serve them deep into the outfield. Jason Heyward has a .378/.351/.350 GB/neutral/FB split, but much of his success against fly ball pitchers appears to come from good plate discipline against them. In terms of the raw mechanics of his swing, he seems to prefer GB pitchers unevenly over FB pitchers — given his 0.97 power fact against GB pitchers and 0.71 PF against FB pitchers. The two swings in the middle both check in at 53°, and though the other two swings have the bat at a much higher angle, we can see his shoulder-to-wrist angle looks like he is swinging low in the zone. His wrists — his powerful, handsome wrists — are making up for the difference here, allowing him to put an uppercut swing on even a pitch well high in the zone. (One double, two home runs). If I was asked to guess which of the three images was the double, I would probably say the far right one. But in fact, it is the middle image (still, he crushed the ball). The fact that he homered on the far right image should remind us that no matter how plausible this theory is, the theory is limited because batters swing at multiple angles all the time. The outside images came from the same game — two homers and 9° of separation. Still, Gordon appears to be most comfortable — judging by the film I have seen of him — swinging at a low angle, more akin to the first two images. Michael Morse is the opposite of David Murphy. Morse’s .266/.391/.389 makes him look borderline hopeless against GB pitchers. And again: SAMPLE SIZE WARNING — a good week could realistically change these numbers around for Morse as he has only some 200 PA against both GB and FB pitchers. Three swings, all above 55°. The far right image, a home run from August 17, comes with his shoulders almost at a level plane with each other. Compare that to Heyward’s high home run (his far right image) where the back shoulder is dipped almost twice as far as his front shoulder. Two home runs, two catchers reaching up for a ball they would never catch, and yet two very different swings. Pierzynski has a FB-favoring .268/.319/.352 split, but he has what appears to be an uppercut swing judging by the still images. The angles are at and below 55°, which anecdotally appears to be the border for uppercut swings, and his back shoulder is dipped. Notice his follow-through — how his bat never goes above his head and how his hands move horizontally across his chest. Pierzysnki may swing at low pitches, but his swing — when watching it live — is clearly not an uppercut swing. His versus-righties swing looks definitely more vertical than his versus-lefties swing, but both are still fairly level — especially considering he has three swings above 55° in the preceding quadtych. I think the important lesson here is simple: Watching the swing live can many times — at least by my eyes — do a decent job of predicting whether a swing his vertical or horizontal. In some special instances, the eyes-on-live-video method is more effective than the still images method — as in the case of Pierzynski. There is no conclusion in this article because this is still a young theory. I need more input, more eyes than God gave me. I have looked at only six hitters in this post and maybe 12 overall — a combined 100 or so swings out of the thousands of swings in the MLB each week. Moreover, these are just the extreme players, the players who have demonstrated a strength or weakness against GB and FB pitchers. Perhaps there is a player out there who swings at a super-low angle or a purely level, 90° angle who excels against both GB and FB pitchers? I could pick players at random to see if I can find such a player, but it would be more effective to hand you the statistics, dear reader, and see what we can do together. So help me out on this: Tell me what is askew, what is too obvious, what is missing. When you watch a game this evening, keep the above stats handy and see if you can predict — based on a player’s swing — whether or not they excel against GB or FB pitchers. Then do the opposite, look at their numbers and predict their swing. We might could together create something cool. A double — nay! — TRIPLE thanks to the aforementioned Jeff Zimmerman for culling the necessary data to even get started on this project. He is, as the scouting reports have suggested, a Titan among men. We hoped you liked reading Swing Planes and Predicting GB-FB Splits by Bradley Woodrum! That spreadsheet is gonna kill my work productivity today.